We're big fans of pilot watches here at T3, and there's one brand that is more synonymous with these types of timepieces than the rest – Hamilton has been timing the skies since the early days of aviation. Exactly 100 years ago they were chosen to be the official timekeepers of the first U.S. Airmail flights between Washington, D.C., Philadelphia and New York. These important routes helped the U.S. economy flourish as the speed of communication increased. 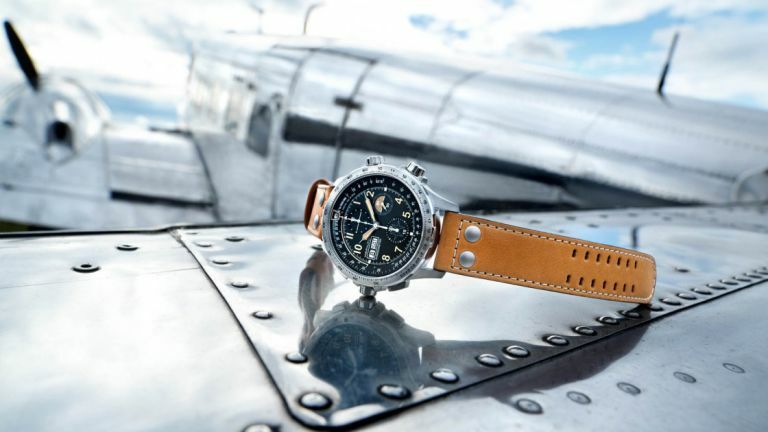 Later, in the 1930s, as commercial air travel started to get more and more accessible, Hamilton become the official watch of the US’ four major airlines, TWA, Eastern, United and Northwest Airlines. It was also selected as the timekeeper for the first non-stop coast-to-coast service of 15 hours and 20 minutes from New York to San Francisco. The brand has come a long way since 1918, but it still has its part to play in aviation. Hamilton is the official timekeeper of the high-octane Red Bull Air Race, and the partner of military squadrons, air rescue services and demonstration teams around the world. Many pilots have requested a new features that Hamilton has then created specially to meet their exacting needs, for example, the brand now includes watches with the ability to log up to 20 flights, with two time zones, and equipped with numerous calculators including those for landing speed, drift angle and fuel requirements. The 2018 Khaki X-Wind Auto Limited Edition is a COSC certified chronometer packed with technical aviation features, including Hamilton’s ground-breaking drift angle calculator, which can be used to calculate crosswinds. We love the subtle ivory-coloured details on the dial, which give the piece a beautiful vintage look. The 2018 Khaki X-Wind Auto Limited Edition is available for £2,250.